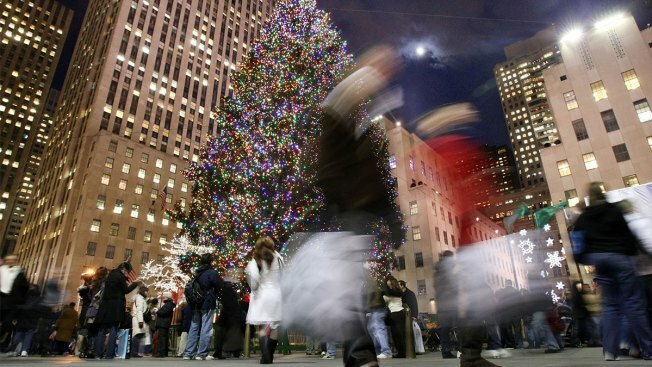 Shoppers walk past the Rockefeller Center Christmas tree Dec. 20, 2007, in New York City. Despite all the changes in retail, one thing remains constant: the holidays are the most crucial season of year. Many retailers can ring up a third or more of their sales during the holiday quarter. The extra shoppers flooding through the doors give retailers like Walmart, Amazon and Target a chance to test new technologies and tout new experiences — and hopefully win a customer's loyalty into the new year. But for those that have been struggling, the pressure is on to earn enough cash to support the business so it can make investments to reinvent their brands and even stave off a bankruptcy filing or simply stay alive. With roughly $5 billion in debt and continued losses, the high-end retailer has a lot to prove this holiday season. Like all department stores, it needs shoppers to buy in its stores, rather than from brands directly. It also needs to manage its discounts and keep its shoppers happy with timely online deliveries. Neiman Marcus has been working with investment bank Lazard to manage its debt load, much of which stems from its sale to private equity firms Ares Management and CPP Investment Board in 2013. Credit ratings agency Moody's recently downgraded Neiman Marcus' debt, saying it could announce a distressed exchange or debt restructuring in the next six months "to proactively address its capital structure." A move to shift its crown jewel business, leading online luxury fashion retailer Mytheresa, away from the grasp of its bondholders has irked some. Looking to revive its business, the retailer has overhauled its executive suite over the past year, bringing in new CEO Geoffroy van Raemdonck. It's also had some reason to be optimistic, it grew its sales last quarter 2.3 percent, helped in part by a stronger economy and high consumer confidence. With significant debt payments coming due in two years, and the U.S. economy potentially nearing its peak, it has a limited window to continue to right its ship. "If they don't have positive comparable sales or good margins, that's a risky sign given leverage still so high," said Perry Mandarino, senior managing director, restructuring head and co-head of investment banking with B. Riley FBR. The holiday season will be the first for new CEO Jill Soltau, who is tasked with turning around a ship that her predecessors could not. Shares of J.C. Penney are hovering over just a dollar, as the retailer has lost track of its core customer, struggled to find the right inventory and left investors uncertain it has reason to exist. It's also dealt with a string of high profile executive departures, including former CEO Marvin Ellison, who left for Lowe's, and CFO Jeffrey Davis. Soltau has said her objective is to put J.C. Penney back on a path to profitable growth. That means, this holiday season, it can't discount its way to sales growth, it also needs to make some money. That challenge may be heightened as it faces liquidation sales from Sears, one of its competitors in appliances. J.C. Penney this past quarter lost 52 cents a share. Its shares are down 62 percent since January. It has $4.2 billion in debt as of Aug. 4, 2018, according to Factset. Analysts have begun to question how it will manage its debt load in the face of its sales and earnings decline. Senior Vice President Trent Kruse recently acknowledged the company's leverage "is a little ahead" of the company, but said its debt does not come due for another five years, giving it time to address those concerns. Kruse also said the company will continue to think about options and opportunities with respect to its real estate and its debt. Sears filed for bankruptcy in October, and it's fighting hard to not to slip into liquidation. Its chairman, Eddie Lampert, has been working on a plan to buy the the company out of bankruptcy, a move that would save both the company and the jobs of some of its roughly 90,000 employees. But Lampert faces a steep task. Some the company's creditors are already urging it to liquidate, wary of Sears' value, particularly in the hands of Lampert. As Lampert dukes it out with the creditors in court, the battle will also take place in Sears stores. The retailer has already said it is shuttering roughly 180 stores, the remaining will need to generate sufficient cash through sales to help the retailer stay alive. "We need to show material progress over the next few months to establish to our senior lenders that a reorganization of the company is realistic and to avoid a shutdown and liquidation," Lampert recently told employees shortly after Sears filed for bankruptcy. Last year, similarly challenged retailer Toys R Us filed for bankruptcy shortly before the holidays. It announced plans to liquidate in March. Hudson's Bay Company, the owner of Saks and Lord & Taylor, has gone through a number of changes since its last holiday season. It hired former CVS Health executive, Helena Foulkes, as its CEO, sold its flash sale website Gilt.com and roughly half of its stake in its European operations. As Hudson's Bay focuses more on its U.S. core business, it needs to show Saks and Lord & Taylor are strong enough to keep the company afloat. Saks appears to be in a stronger position. Its sales this past quarter grew 6.7 percent over the same quarter a year prior. "Saks is well positioned as a high-end luxury fashion authority, but there is much room for improving the retail fundamentals," wrote analysts at Scotiabank recently. At the division that houses Lord & Taylor, Home Outfitters and its namesake store, sales dropped 3.8 percent during the latest quarter. This holiday season will be the last one in which shoppers can visit the holiday windows at the Lord & Taylor store on New York's Fifth Avenue. The store is one of a number that will close as Lord & Taylor looks to slim its footprint, hoping to redefine its place in retail. The department store has been struggling to find its place as it sits in the awkward spot of being neither the high- nor low-end. Shares of the Canadian company are down 34 percent since January. One of Amazon's first targets has not yet figured a way to get out of its fire. Barnes & Noble now has a market capitalization of just $505 million, a size that founder and executive chairman Leonard Riggio has said is "problematic" and would make the company better suited to be private. But with with annual sales having dropped every year since 2012, according to Factset, the company has a lot to prove to both potential buyers and financiers. The bookstore's plan this year rests in part on its campaign "Nobody Knows Books Like We Do." In the campaign, Barnes & Noble is highlighting its more than 20,000 current employees, along with their knowledge of books, as reasons why its stores are unique.